What is wifi hotspot? Most of the people such online and want to know bit more about hotspot internet. Just an example, you go anywhere for more than one week and you get a hotel room for staying around a few days. But there do not have any internet connection, in the moment you need to browsing internet, send mail, chat with your friends on facebook etc. But how to use internet if there do not have any broadband internet connection. Don’t worry if you have iphone, then your iphone mobile hotspot can solve the problem easily to share hotspot internet. You should follow our tips for how to set up hotspot on iphone and then you can enjoy wifi internet with your others wifi device, laptop, ipad, or android device. I just talk about how to set up hotspot on iphone. Before set up hotspot for iphone you should know something about wifi hotspot iphone. Fist you need to find 3G or 4G network signal on the hotel, if you get any 3G or 4G network signal on your iphone then buy unlimited internet data plan from ISP. Why you need to buy unlimited internet to share wifi hotspot? When you start to share hotspot internet with others then the mobile broadband need unlimited data plan otherwise you are not benefited from hotspot internet. 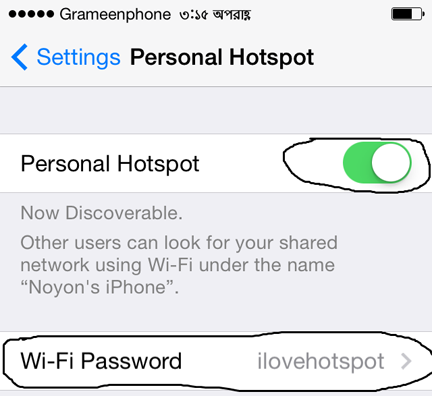 Before start to set up hotspot on iphone I want to discus something about it. Personal hotspot is a feature of apple that allows shearing internet over wifi data connection with range of wifi device on iOS 5.0 higher. You can turn on apple hotspot on iphone4, iphone4s, iphone5, iphone 5s, iphone 6, iphone 6 Plus, ipad 2 mini and 3rd generation ipads who runs on the devices operating systems iOS 5.0 higher. When you turn on wifi hotspot on iphone then the phone will work as a portable wireless router. So, you can share internet over the portable wireless router very easily. Without any free wifi hotspot app you can share mobile broadband internet very easily. Now we are undestand what is a wifi hotspot. So that, we can comment together the apple has good feature of hotspot for iphone. 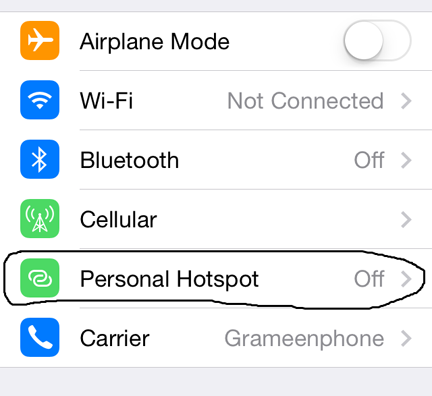 To set up personal hotspot on your iphone; Tap on the settings menu form your home screen and move down to find out Personal hotspot. If you find out already the Personal hotspot then tap to move it on (if on then you will see green check point) I just talking how to set up hotspot on iphone. 5. Work is done! Now come back on Mobile Data and tap to enable Mobile Data and 3G or 4G then see the down menu shows Personal hotspot off. 6. Now touch it for on and then the personal hotspot wants from confirmation to turn on Wifi and Bluetooth or USB. You should turn on Wifi then your personal hotspot is ready to use. 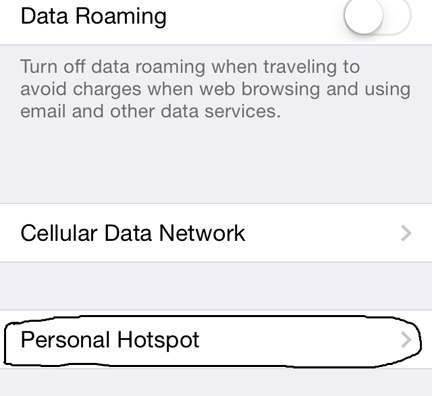 Warning: Before I was talk about Personal hotspot on iphone. If you turn on the personal hotspot on your iphone then decrease battery life faster. Because after turn on personal hotspot the iphone work same like as wireless router and we know that 3G or 4G data connection data load fist but decrease battery life of mobile.